A judge dismissed a suit this week from Nebraska inmate Stephen Cavanaugh, who sought religious accommodations from prison officials in order to properly worship the Flying Spaghetti Monster, deity of the Pastafarian faith. 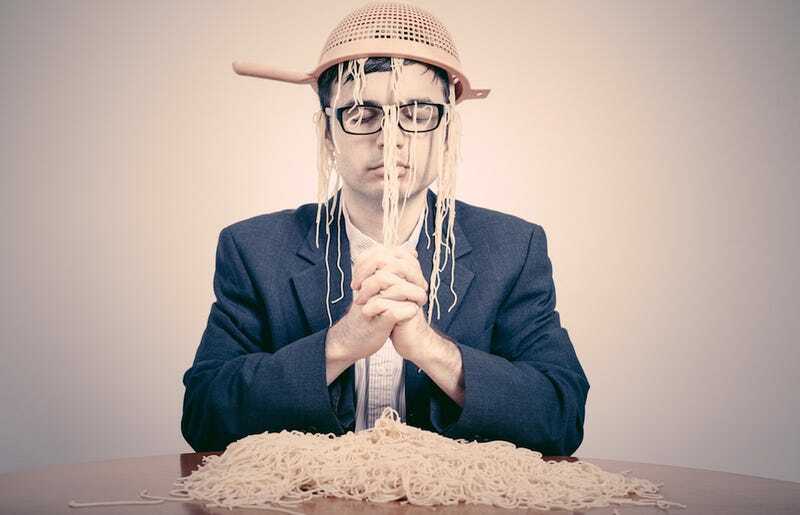 The Church of the Flying Spaghetti Monster was founded in 2005 by Bobby Henderson as a satirical protest against the prospect of “intelligent design” being taught alongside evolution in schools. Members of the church believe that humans evolved from pirates, not primates, and that heaven includes a “stripper factory” and a beer volcano. The Flying Spaghetti Monster, or FSM, has two meatballs and a pair of googly eyes, and is credited for creating the universe and maintaining gravitational forces with his many noodly appendages. The Cavanaugh ruling is a setback amid years of small victories for the carb-based religion; several U.S. citizens have in recent years been granted the right to wear a pasta colander on their head in driver’s license photos, and as of January 2016, Pastafarianism has been officially recognized as a religion in the Netherlands (it is also recognized in Poland and New Zealand). According to Ars Technica, Cavanaugh, who is serving a 4 to 8 year sentence on weapons and assault charges, sued for $5 million and the “ability to order and wear religious clothing and pendants, the right to meet for weekly worship services and classes and the right to receive communion.” The religious clothing in question was a pirate costume. A prisoner could just as easily read the works of Vonnegut or Heinlein and claim it as his holy book, and demand accommodation of Bokononism or the Church of All Worlds [...] Of course, there are those who contend—and Cavanaugh is probably among them—that the Bible or the Koran are just as fictional as those books. It is not always an easy line to draw. But there must be a line beyond which a practice is not “religious” simply because a plaintiff labels it as such.